Andy: You can really taste the fake sugar. It has a decent lime smell. This would be good if you have a cheap white rum to mix with it to bring up the alcohol content. A better option for me, is to take a regular decent rum and add lime juice to it. I’m not sure I would buy it again. Adrian: It has a good lime aroma and it is very mild. I am looking forward to trying it with pineapple juice. It tastes good with pineapple juice but you wouldn’t get drunk off it. 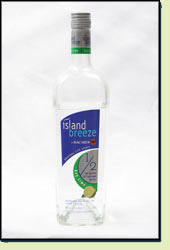 Looking at the label, I notice it has 18% alcohol, which to me, is a complete waste of my time. It keeps it’s tartness with the pineapple juice but is better with coke.